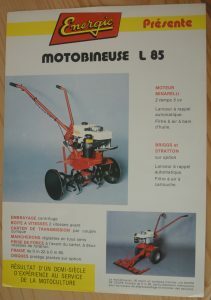 Energic Motobineuse Type L 85. Engine/Moteur. 2 types; Minaralli 2 temps 5 cv. and Briggs & Stratton 5 cv. Air filter. In a bath of oil (Minaralli) with paper filter (Briggs ans Stratton). PTO/Prise de Force. Front of the engine, 2 speed. Options. Cutters/Fraise 22 cms to 65 cms. Read more about Motobineuse MVR 75 here.